The Adopt a Monument Manual has been designed to provide a framework and guidance for community groups who wish to engage with their heritage. This manual covers some of the key factors, requirements and scenarios that are common to heritage projects across Ireland. The manual is based on the work of the Adopt a Monument Scheme. This scheme has been running in Ireland since 2016, and it is an initiative by the Heritage Council (managed by Abarta Heritage) to help to bring monuments and local heritage from the periphery into the heart of the community. Adopt a Monument encourages, mobilises and engages with a variety of people from across the community. It forms collaborations between communities, state bodies and conservation & heritage experts, to ensure best-practice in the conservation and interpretation of our monuments. What is the Adopt a Monument Manual? 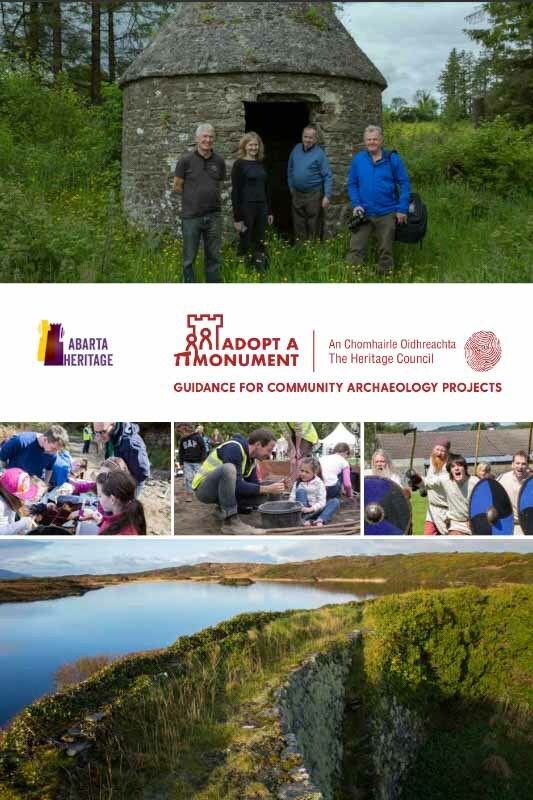 The Adopt a Monument Manual has been designed as a guidance document for participants in the Heritage Council’s Adopt a Monument Scheme, but we hope it is also useful for any communities who are interested in carrying out community heritage projects. Community heritage is becoming increasingly popular each year, and we hope that the manual provides information and techniques about some of the common factors that may occur in any heritage project. The manual was written by Róisín Burke, Neil Jackman and Conor Ryan of Abarta, with contributions and support from the Heritage Council, the National Monuments Service and Archaeology Scotland.